1 The traditional old capital of Montenegro is Cetinje. 2 considered commonly as the Ijekavian dialect of the Serbian language. 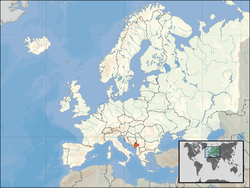 3 Adopted unilaterally; Montenegro is not a formal member of the Eurozone. 4 .me became active in September 2007. Suffix .yu will exist until September 2009. ഈ താൾ അവസാനം തിരുത്തപ്പെട്ടത്: 20:16, 20 ഡിസംബർ 2013.